Recently, two picture books have come into the house that I love to pick up just to look at the amazing illustrations. The first is a library book that they had on display, Walt Disney's Alice in Wonderland, a retelling of the Disney version of Alice by Jon Scieszka. 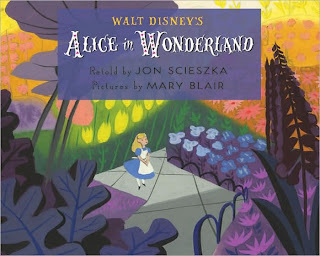 The art in this book is compiled from the original Alice imaginings by Disney artist Mary Blair. I am a pretty big Alice in Wonderland fan so it was interesting to see the first artistic ideas for the movie. The pastels are somehow muted yet vivid. While Alice was changed quite a bit, so many of the backgrounds and peripheral characters are almost exactly what Blair created. The text in this book is only so-so (from the perspective of a fan) but probably sufficient for a child just becoming interested in the story. I just wish that they had kept the "crab-grass" in the garden scene! 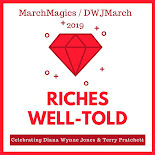 The second book is one that I originally found out about through MotherReader's review and that made its way into Z's Easter basket (well, next to it because it's large). 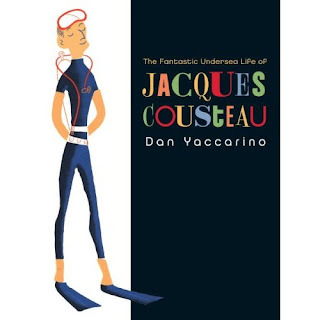 This book is The Fantastic Undersea Life of Jacques Cousteau by Dan Yaccarino. He is the creator of Oswald and has many other picture books. This one is just incredibly fantastic though. The textures of the undersea world and the portraits of Cousteau are wonderful. The color palette can be seen in the title. This book also delivers a wealth of positive messages to children gleaned from Cousteau's own life -- perseverance, curiosity and environmental responsibility are just a few of them. Which picture books do you love for their art? Buy Walt Disney's Alice in Wonderland and The Fantastic Undersea Life of Jacques Cousteau on Amazon or find them at your local library. Most picture books I buy, I buy because of the art.